Certain public figures become associated in the public’s mind, often thanks to mimics and comedians, with particular catchphrases or vocal tics. Sometimes, however, these associations are inaccurate or exaggerated. Cary Grant never actually said the words “Judy, Judy, Judy” in any of his movies, for instance, nor did James Cagney ever truly call someone “you dirty rat.” But late astrophysicist Carl Sagan really did say “billions and billions” with great frequency over the course of the 13 original episodes of his 1980-1981 series Cosmos. He said “millions” and “trillions” a lot, too. And now, a YouTuber named Robert Price has assembled a supercut to prove it, with a gentle hip-hop underscore, no less. Over the course of three restful minutes, Price strings together what he promises are “all the -illions from Cosmos and in order.” (Viewers of the video are even invited to listen intently for a rare appearance of “quadrillion” along the way.) 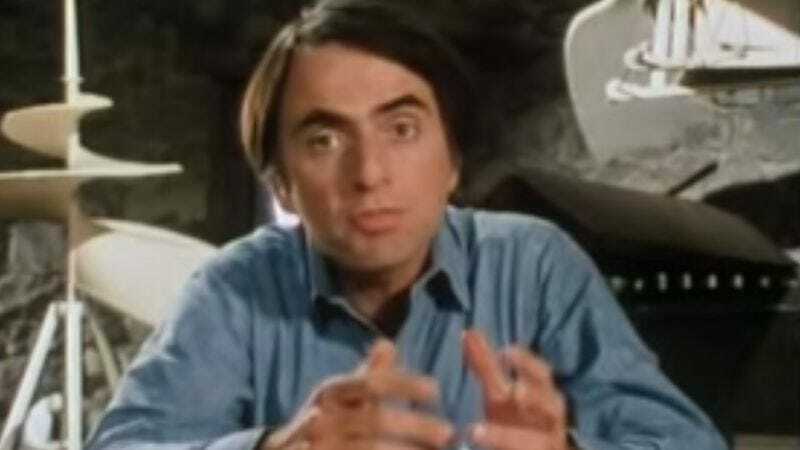 As Johnny Carson so ably proved time and time again, doing a killer Carl Sagan impression really boils down to the ability to say the word “billions” in a slightly pinched, nasal voice, making sure to draw out the vowel sounds. Of course, a brown turtleneck and a repurposed Beatle wig help further the illusion as well.